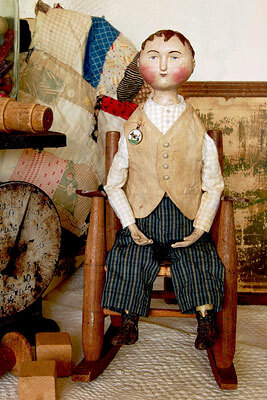 Jasper is one in my series of boy dolls, which are less common than girls in the world of antique papier mache and china dolls that inspire me. Whether that's because they were more roughly played with by their own little boy owners, or there were not as many made is not clear. The ones that still exist were usually made from the same molds as the girls, but were painted and dressed somewhat differently. Real boys and girls in Victorian times were not actually dressed as separate genders until they were 5 or 6 years old. My own boys, as I like to call them, are generally older than that, and are dressed in a style we modern people associate with males. They are, I'm told, appropriate companions for my girl dolls, if one is so inclined. My dolls range from 7 inches to 16 inches tall, and are each handmade from papier mache clay and cloth. All the clothing is custom made for each doll.